THIS BOOK is currently being Revised. It should be out by 2020. Some people say, “It works for me.” No, it does not work for you; just look around. You think the only people living in nice homes and driving nice cars are those who send money to preachers on TV? The atheists have good paying jobs, the Mormons are some of the most prosperous people in the U.S.; they own multimillion-dollar companies and live in big homes. But YOU think you are prospering because you send money to a preacher on TV! You are being tricked and lied to! You think you are prospering because you help your pastor drive a Cadillac; but you are WRONG! The “Church of Christ” denomination members drive Cadillacs, the Buddhists have high paying jobs! Stop believing the lies! Unlike other writers on this subject, I once believed the Prosperity Gospel, but after twenty years of financial struggle and frequent unemployment God called me to research the Prosperity Gospel. What I found proves the Prosperity Gospel is totally false, and a horrible sin, and I call for a Reformation of the Charismatic Movement. 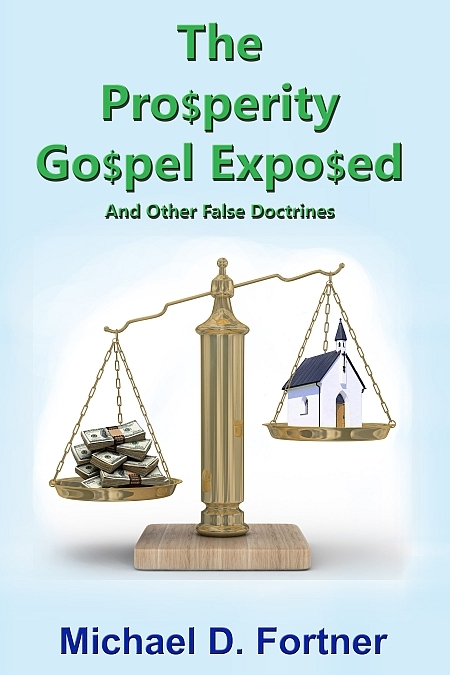 Other books on this subject take a theological point of view, but the prosperity teachers failure is in not properly interpreting the Scriptures; so I analyze every verse they use to teach the Prosperity Gospel, and give the correct interpretation. As a result of properly interpreting the Scriptures, this book totally destroys the Prosperity Gospel. All American Christians have been deceived by wealth, not just Charismatics, the result is spiritual lukewarmness. The Scriptures show that Biblical prosperity is having all your needs met, or not being in want, but American Christians are into having lots of stuff. I also say that many pastors, especially the mega-church pastors, earn too much money, while Jesus taught that his future ministers should live without high incomes or material wealth. This book says most preachers on Christian TV today, are those the Bible refers to as almost true yet false prophets because they are leading people away from the truth. This book further discusses the most well-known Word-of-Faith doctrines and shows the correct doctrines from the Scriptures. But I am not against all Pentecostal / Charismatic doctrines, but take a balanced approach because I grew up attending an old fashioned Pentecostal church. I believe Christianity in America today is the church of Laodicea, and so God has already started to refine us as gold; which means suffering the fire of judgment. In the final chapter I detail the economic and natural disasters that have come upon America in the last few years and show that it is the judgment of God upon us. The judgment will likely get worse until we repent, resulting in another Great Awakening in America. There are also links to videos at the top of this page, below the banner image. Click to see larger cover. Click on the link below to see all the comments. The author was called into the ministry at age 20, but because he is not an eloquent speaker he chose to spend his adult life doing in-depth study of the Scriptures. He has a B.A. in journalism with a minor in history, and is a skilled researcher, with God-given ability to figure things out. He is also the author of “The Truth About United Flight 93” showing that the conspiracy theories about the crash are false. And, Discoveries in Bible Prophecy; The Beast and False Prophet Revealed; The Fall of Babylon the Great America; and The Approaching Apocalypse and Three Days of Darkness. Read sample chapters here: www.usbibleprophecy.com.